Carolus (Carel) Hacquart was one of the most important Netherlandish composers of the seventeenth century. His comprehensive opus III “Chelys” consists of 12 suites for viola da gamba and basso continuo. This work is preserved in a print of 1668 on fifty-six cleanly engraved pages. The bass part is missing however. In addition to the original print we also have several manuscript copies of part of the work, which contain the original bass line of a quarter of all movements. Furthermore, the viol part is laid out in such a way that it explicitly or implicitly contains the bass line in its polyphonic structure, which is interspersed with chords. It was therefore possible to reconstruct the bass line in all places where it has not been preserved. For players who are not experienced in continuo playing, a second score with a realization of the figured bass is included. 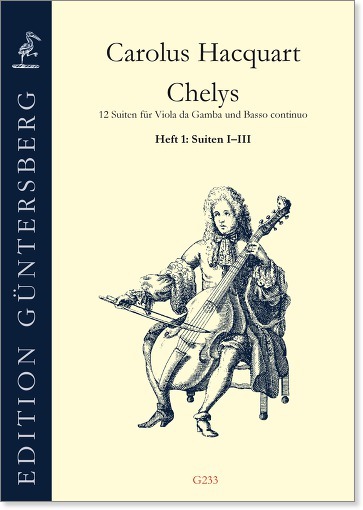 We are pleased to be able to publish this beautiful music for the first time in our day, and hope that it will soon have a place in the standard repertoire of every viol player.